« The First BMW Motorcycle. Still A Design Reference. Published by Cyril Huze September 10th, 2015	in Builders, Customs and Editorial. A 30” front wheel job performed by Thunderbike Germany thanks to their Bolt-On Bagger Kit. 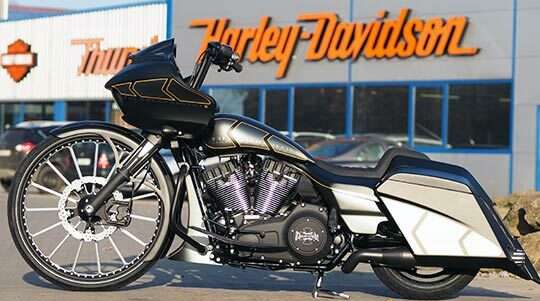 Bike: Harley-Davidson Road Glide 2015. Forks: Thunderbike. Suspension: TB Air Ride (Front + Rear) Triple tree: Thunderbike Bolt-On Bagger Kit. Wheels: Thunderbike Spoke Light (4.0 x 30.0) Gas Tank: Thunderbike Alu Tank. 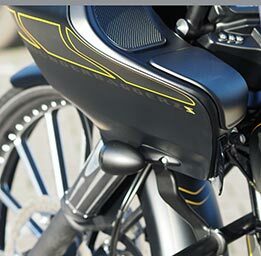 Tail: Thunderbike Daytona Bagger-Kit. 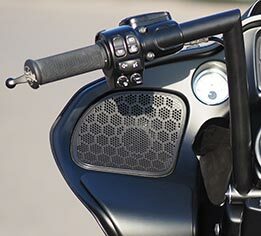 Aircleaner: Thunderbike Powerfilter “TB”. Brake discs: TB Calipers: TB Radial. 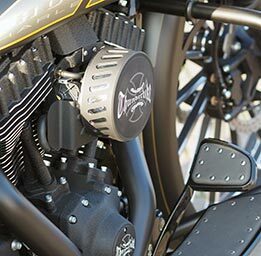 Exhaust: Vance & Hines with Thunderbike Caps. Handlebar: Thunderbike Flip II. Floorboards: CCE Banana. Rockerboxes: Thunderbike Ribbed. Front fender: Thunderbike. Bugs spoiler: Thunderbike. Paint: Kruse Design. My….isn’t that ridiculous. 30″ out front should have at least 40″ wide out back right? Don’t care for the wheel, but the fork/monobloc calipers are pretty sweet. how big can they go ? I guess we’ll see …………………………….Q up the circus music ! Big wheels keep on turnin…. …….errr well nevermind about that. Guess I’m not the only one who thinks this looks stupid….lot’s of money and time spent to create…. what? Thats no cheap build. As long as fools want the big wheel bike the builders will build them. Front wheel is a little small, needs a 36. Worse than hardtail choppers, they cannot sell those things for anything close to what they got in them. Why ! What about riding ? I will bet he is not riding that 600 miles a day ! Like most of these 30″ stretched out fender and bag creations, kiss the back of that rear fender goodbye after about the first speed bump. Nice looking ride. 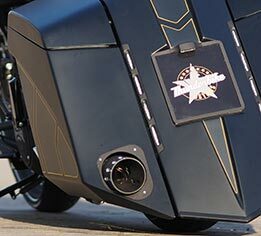 Those of us who actually build and ride these custom baggers know that they ride very well, when properly built. A lot better than a stock bike, in many cases. 25 years ago, 18 and 20 inch wheels on passenger cars were almost unheard of, and the self-proclaimed “old school” hot rodders turned up their nose at the fad. Only it wasn’t a fad, it was a paradigm shift. Today, your wife’s SUV is probably rolling on 22s, and nobody even notices. The same thing is happening in the motorcycle world, it just took a little while to catch up. Mike, you are right and I agree. Rule 1 is build what suits you. I think paradigm shift is not what we have here. Back in the ’70’s that term was thrown around about longnecks too. Where are they now? Picked clean for parts for board trackers and cafes, bobbers and street fighters. Fads come and go. That 30″ rim is going to make somebody a fine mailbox post in a few years. going to be alot of motors and trans for the taking with this trend goes pear shaped. Personal opinion… I just don’t get the old English high-wheel bicycle look! people might like the looks , but u have absolutely no front suspension travel . Screw it ! Let’s Ride ! You ride yours and I’ll ride mine !